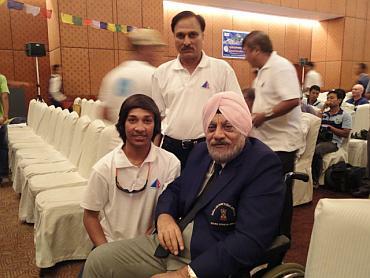 India's youngest Everest summiteer Arjun Vajpayee was expected to receive a medal from Nepal President Ram Baran Yadav at function on Saturday, but instead recieved his medal from Nepal's Minister of Tourism & Civil Aviation Sharat Singh Bhandari. Yadav and Nepal Prime Minister Madhav Kumar Nepal both skipped the felicitation ceremony in view of the volatile political situation in the country. Major Ahluwalia had climbed the formidable peak when he was 26 years old -- on May 29, 1965. A few months later, the major was seriously injured while fighting in the India-Pakistan war and confined to the wheelchair. He was awarded the Padma Bhushan in 2002. Image: Arjun Vajpayee (left) with his father Sanjiv (standing) and Major HPS Ahluwalia (seated).